But Instagram influencer Harimao Lee, from Hong Kong, has sparked outrage online after she shared a glamorous mid-air photograph enjoying business class on an international flight. Staring out of the window in awe as she sipped champagne at 30,000 feet, the photographer sat comfortably in her seat, with a blanket draped over her legs. 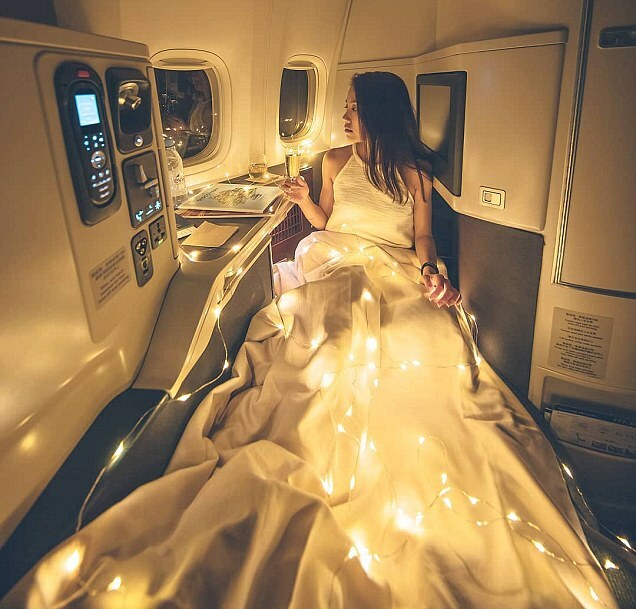 And to add a sparking touch to the frame, she surrounded herself with fairy lights in her cabin when she travelled between Hong Kong and Rome. It was the long dark night during the flight from Hong Kong to Rome. Stargazing is one thing to do in the cabin,' she said in the caption. But her perfectly staged picture has been met with ridicule, with many questioning the odd choice of item she packed in her carry on suitcase. 'What the actual f***? Who in their right mind brings fairy lights on a plane?' One wrote. Other people also pointed out that she was sitting in the opposition direction of the upper-class seat. 'She is indeed seating in the opposite position... probably because the photo would look better. Indeed great photo I must say,' one said.